Buds are embryonic branches or flowers in a dormant state ready to resume growth when it gets warm again. 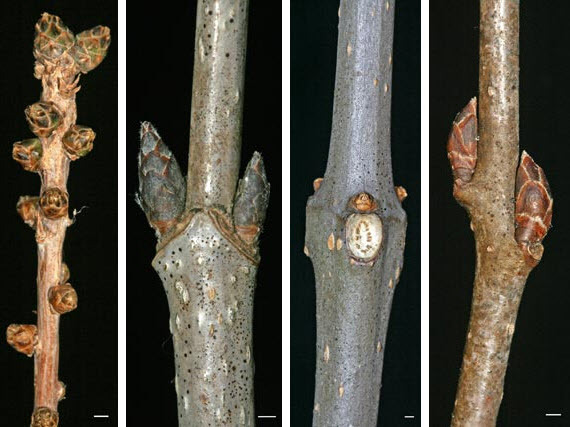 The buds of most species are protected by tough bud scales. Bud scales can either be arranged in pairs facing each other edgewise (valvate bud scales) or overlapping like shingles (imbricate scales). A few species have naked buds that lack scales and are protected instead by a pair of miniature leaves. 1. 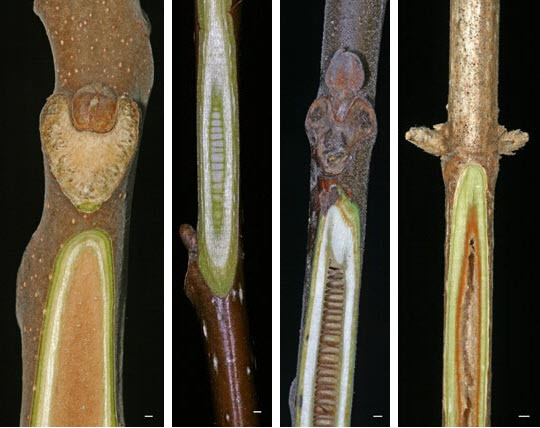 Flower bud, cross-section, of horse-chestnut (Aesculus hippocastanum) showing bud scales. 2. Valvate bud scales of tulip-tree (Liriodendron tulipifera). 3. Imbricate bud scales of sugar maple (Acer saccharum). 4. Naked buds of witch-hazel (Hamammelis virginiana). During the growing season lateral buds develop just above the point where the leaf rises off the stem. At the apex of a twig there may be a terminal bud that is larger than the laterals and points strictly forward. 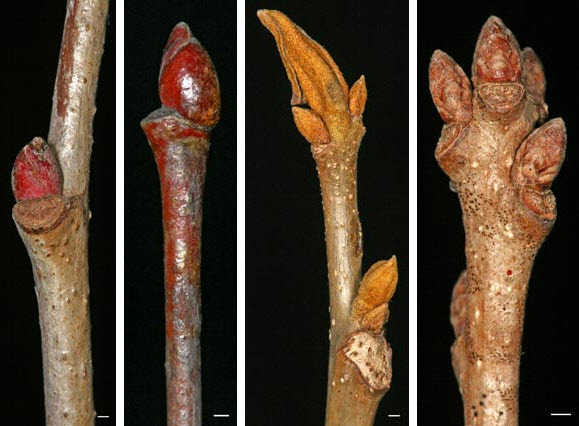 Some twigs lack a terminal bud, having instead a false terminal bud at the end of the twig which is actually the last-formed lateral bud. Alongside a false terminal bud look for the tip scar — a remant of the sloughed-off portion of the branch tip that formerly extended past the bud. Oaks are noted for their clustered end buds that are actually lateral buds with very short internodes crowded towards the end of the twig. 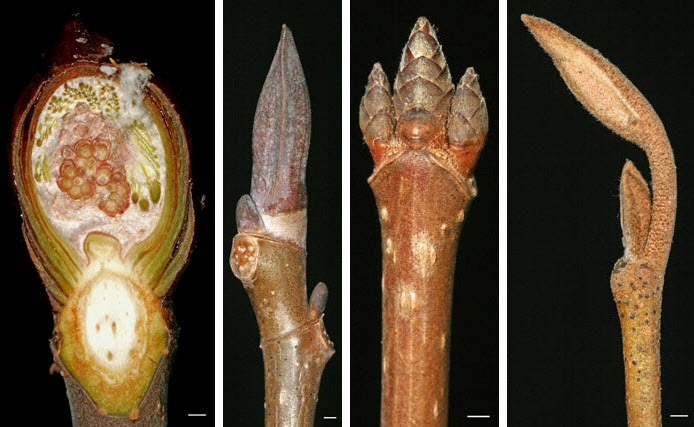 Bud examples (Left to Right): 1. Basswood (Tilia americana) lateral bud. 2. Basswood false terminal bud and tip scar. 3. Bitternut hickory (Carya cordiformis) with true terminal bud distinctly larger than laterals. 4. Clustered end buds of chinquapin oak (Quercus muhlenbergii). The point along a branch where a leaf is attached is called a node. “Phylotaxy” is a descriptive scheme that describes the precise manner in which leaves are arranged on a branch. The simplest set of phylotaxy descriptors calls attention to the number of leaves (and accordingly the axillary buds) per node.There are three types of leaf (bud) arrangement, of which the most common is alternate, i.e., one leaf (bud) per node. Less frequent but by no means rare are species having two opposite leaves (buds) per node. A very few plants have whorled leaves (buds), with three or more at each node. 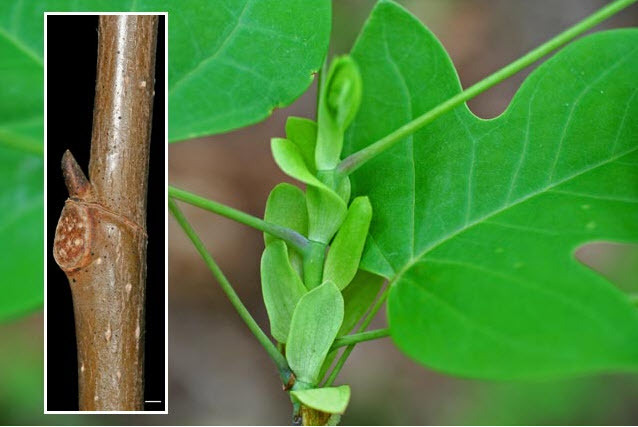 Sub-opposite buds are morphologically alternate, but they are have such a small length of twig (internode) between them that they practically appear opposite. 1. Alternate (bald-cypress, Taxodium distichum). 2. Opposite (elderberry, Sambucus canadensis). 3. Whorled (showy catalpa, Catalpa speciosa). 4. Sub-opposite (common buckthorn, Rhamnus cathartica). When a leaf falls from a branch at the end of the growing season, a rough patch reamins under its base, the leaf scar, within which there are one or more bundle scars –remnants of the “plumbing” (vascular system) connection that extended between the veins of the leaf and the branch. Leaf scars come in many distinctive shapes and sizes, and the number and distribution of bundle scars is distinctive, too. 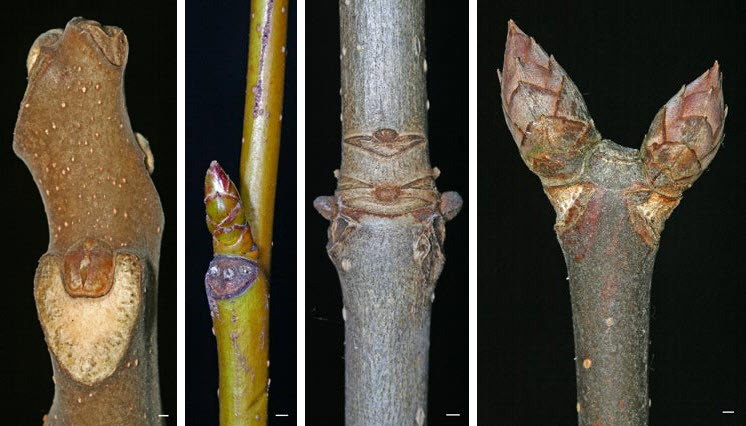 A useful feature to determine the age of a twig (or how much growth occurred in one season) is an array of several narrow, crowded, bud scale scars left where the scales fell from a true terminal bud at the initiation of the growing season. When fruits fall off a tree, sometimes they leave a fruit scar. 1. Large leaf scar of tree-of-heaven (Ailanthus altissima) with U-shaped arrangement of bundle scars. 2. Eliptical leaf scar of sweetgum (Liquidambar styraciflua) with three distinct bundle scars. 3. Bud scale scars marking the end of one year’s growth and on red ash (Fraxinus pennsylvanica). 4. Buckeye (Aesculus glabra) fruit scar. Tulip-tree (Liriodendron tulipifera) stipules and twig showing stipule scar completely encircling the twig. Although they both hurt when you grab them (or if you are a deer, when you try to eat twigs that have them) there are slight anatomical differences between the various types of plant armature. Spines are modified leaves or stipules and as such are generally thinner and shorter than thorns, which are modified branches. Prickles are slender outgrowths of the epidermis. 1. Stipular spines of blacklocust (Robinia pseudoacacia). 2. Thorn of hawthorn (Crataegus crusgallii). 3. Raspberry (Rubus allegheniensis) prickle. Plant surfaces usually lack hairs (i.e., are glabrous), so when we see ones that are pubescent (hairy), they stand out. Similarly, twigs may be smooth or have wing-like ridges, depending upon the species. 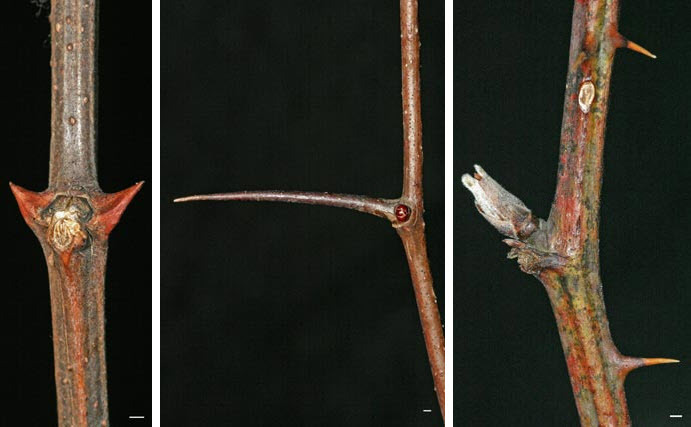 The surface of the twig is often a good feature to distinguish otherwise similar species within a genus. 1 and 2. Pubescent and glabrous twigs of staghorn sumac (Rhus typhina) and smooth sumac (R. glabra). 3 and 4. Winged and smooth twigs of blue ash (Fraxinus quadrangulata) and green ash (F. pensylvanica). 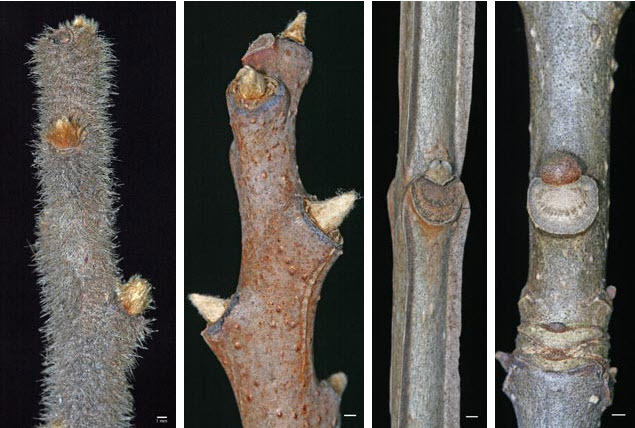 The central cylinder of a twig –the pith — is composed of non-woody tissue having a markedly different texture than the surrounding remainder of the twig. Viewed in a longitudinal section made with a razor blade or sharp knife, there are several potentially distinctive aspects of pith. Most species have pith that is fairly unremarkable: smooth without any interuptions, called continuous homogenous pith. More interesting pith has cross walls (partitions). If these partitions occur additional to continuous material in the center of the twig the pith is said to be diaphragmed, whereas if the partitions occur in an otherwise hollow space the pith is chambered. A few species lack pith altogether. Pith examples (Left to Right): Continuous homogenous pith of tree-of-heaven (Ailanthus altissima). 2. Diaphragmed pith of tulip-tree (Liriodendron tulipifera). 3. Chambered pith of black walnut (Juglans nigra). 4. Hollow (no) pith of honeysuckle (Lonicera sp. ).